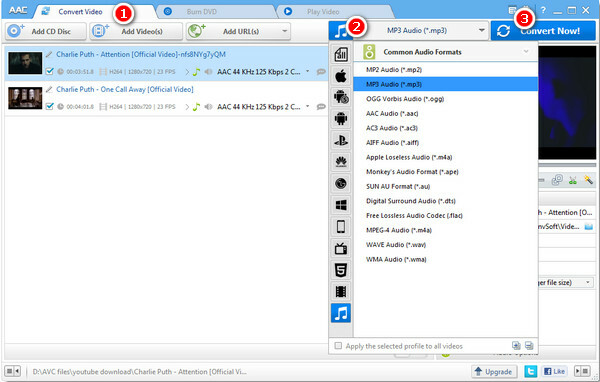 How to Use Any Audio Converter? How to Convert Audio/Video to other Audio Formats? 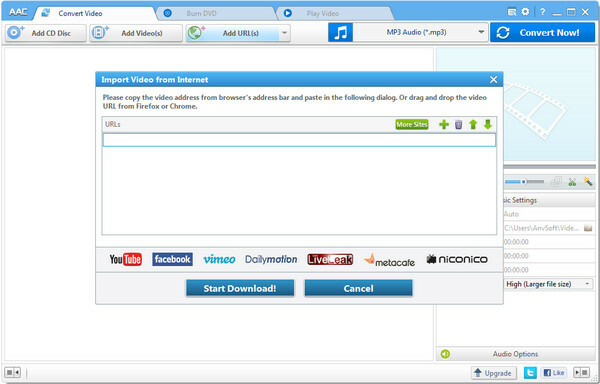 After you run the program, click the "Add Videos" button to select audios and videos from your hard drive. MP3, OGG, WAV, AAC, M4A, WMA, AIFF, APE, FLAC, AC3, AU and etc. audio output formats are available. When you finish set output format, just simply click the "Convert" button to convert added or selected files to specified format immediately. After the conversion, click the Open Folder button in the bottom of the program to open the output folder. 1. Click "Add URL" Button and paste YouTube URL to the pop-out box. 3. How to Burn Videos to DVD? Step 1. Go to "Burn DVD" window, then click Add Video(s) button. Step 2. Choose DVD video NTSC Movie or DVD video PAL Movie according to your TV system. Step 3. Click "Convert NOW!" Button to start convering and burning videos to dvd. Step 4. In the "DVD Burning Engine" window, click "OK" button, the drive automatically ejects the disc. A well-designed audio converter for Windows users to convert any audio which can be played in Spotify to MP3, WAV,FLAC or AAC format with 5X faster speed and good output quality. All ID tags are kept after conversion.